Why have I traveled all over the world, at least to six continents and have flown over both poles, to view a total solar eclipse? Because I caught the bug back in 1991, July 11 to be exact, when the 6 minute and 27 second spectacle was visible from our hotel. I have the comments on tape somewhere, and I remember that I uttered sounds I didn’t think I could make. This is a brief You Tube video of the last seconds before totality, the Diamond Ring, and early totality from Libya in 2006. I have a better video of the recent 2010 eclipse from Argentina (link here or at end of this post). People are changed by the experience. Some cry. I was a bit frightened during my first four when I saw the Sun disappear. This is primal stuff. But it is beautiful. The most beautiful sight in nature? Maybe. It is certainly for me in the top three. After a little bite is taken out of the Sun (first contact) by the Moon, the show progresses very slowly at first, until suddenly one realizes that sunglasses are no longer needed and that the light has changed to a weird yellowish cast. As the light continues to slowly dim, one’s shadow becomes very stark–each hair on your head can be discerned. Holes through leaves in trees become crescents, hundreds of crescents. Then, with a few minutes to go, there appears a dark wall in the west as if a silent thunderstorm were approaching. This is the approach of the shadow of the Moon. The light diminishes to where there are discontinuities where the limb of the Moon, which is not perfectly spherical, but has mountains and valleys, lets some light through and blocks other light. These are the Bailey’s beads. Finally, one bead is left, one brilliant last bit of sunlight, with the beginnings of seeing a black hole around a bright light and silvery fine corona. This is the diamond ring, and usually people shout it out. Finally, the sun light is extinguished, somebody yelling, “Filters off!” since it is now safe to look with the unaided eye. And there is the corona and the black hole in the sky, a total solar eclipse. I’ve traveled half way around the world to India for 43 seconds of totality; I’ve traveled to the South Pacific for 33 seconds. I’ve traveled to South Africa only to be clouded out at the last hour. And in China, last July 22, we were thought to be clouded out when, with 2 minutes to go until totality, a small hole appeared, giving us a view of the corona. Click on the pictures below to see them fully round, rather than oblong! Why do I go to these? Because I can’t imagine not going! Above: Just before the diamond ring (Aruba, 26 February 1998). Below shows totality with the corona. There is an inner and outer corona that show up depending upon exposure of the camera. I don’t film these any more, but if you want to see some really good shots, my good friend Eliot Schechter, a nationally known photographer, has some great shots on his Web site. His picture of a totally eclipsed Sun with the dark Moon’s shadow taken from a jet was the 1 August 2008 eclipse over the high arctic. There are also annular, or ring, eclipses, where the Moon does pass in front of the Sun but is too far away from the Earth to cover the Sun completely. Both the Moon and Sun vary in their distance from us; the Sun’s variation is only about 3%, but the Moon’s is 12%. This changes their apparent size in the sky, and that is all it takes to turn totality into annularity, darkness to a little less bright. Still, annular eclipses are beautiful to see. The above was taken in Bisbee, AZ 10 May 1994. The lower was in San Diego 4 January 1992. We were told by several that annular eclipses weren’t worth a trip to San Diego. I believe the word was “Big Deal.” We left Tucson in the rain, and got to San Diego with partly cloudy skies. We parked ourselves on top of Mt. Cube and watched the fully annular eclipsed Sun drop into the Pacific Ocean. Maybe it wasn’t total, but it was one of the most lovely sights I’ve ever seen. Two hours later, it was pouring rain. We lived right! The most exciting of all was the Siberian eclipse of 9 March 1997. That’s right, Siberia in March. We went the long way around via Salt Lake, NYC, Moscow and an all night flight to Irkutsk. After a couple of days on frozen Lake Baikal, we took the Trans-Siberian railroad to Chita, which even our guide referred to as a “hole.” While it had been clear the night before, it was totally socked in at Chita. Thoroughly bummed, the 12 of us took a bus to the eclipse site. As we got closer, the clouds thinned and the Sun rose higher. We got to the site with a clear view of the Sun! What I remember most was watching the approach of the Moon’s shadow, the “Eye of God.” approaching. I have never seen anything so dark. And then to watch four planets, a comet and the eclipsed Sun for just under 2 minutes. I tried photographing it, but the below zero temps froze the camera. I just dropped it in the snow and looked. That was better! Let the pros do the shooting. I’ll do the looking! Very few saw this one; we were among the lucky! Next total solar eclipse: 14 November 2012 in northeastern Australia and SW Pacific basin. 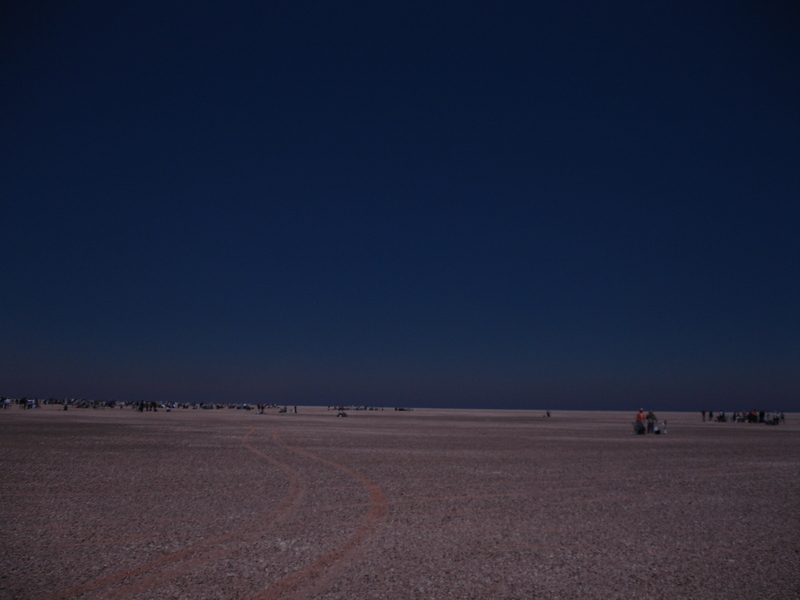 The above picture was the Moon’s shadow leaving our site in Libya 29 March 2006. It is noon, if you can believe it! 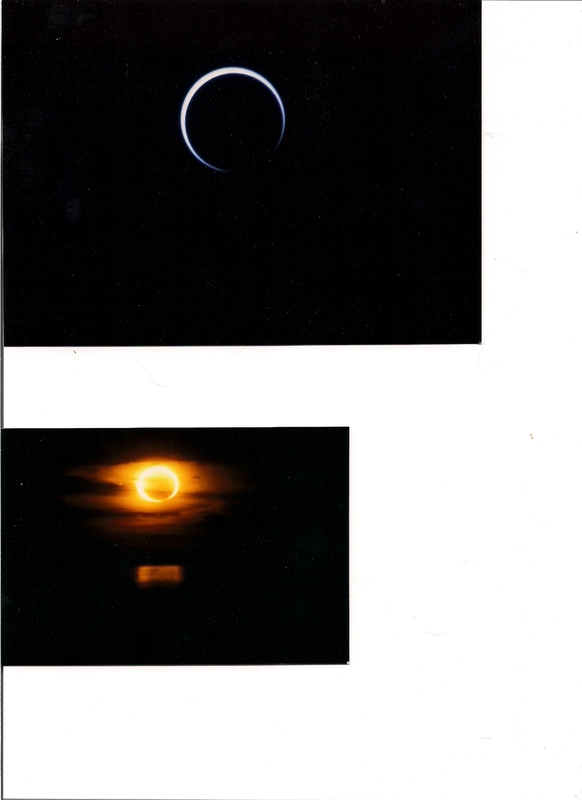 The recent annular eclipse of 15 January 2010 is on another post with both pictures and a video. We’ve gone to Spain and Costa Rica for annulars (picture to right taken through a filter of the 3 October 2005 eclipse from Javea, Spain) but usually don’t travel long distances for them. But I got the bug for this one, the longest annular in the third millenium (over 8 minutes), and Kenya provided a great excuse, since I had never been to East Africa and never thought I would get there. The next annular eclipse, 20 May 2012, has a track from northern California through Nevada, southern Utah/northern Arizona, New Mexico, ending in west Texas. Visit the post for the recent 11 July 2010 eclipse from Patagonia, Argentina. In a word, we were lucky! 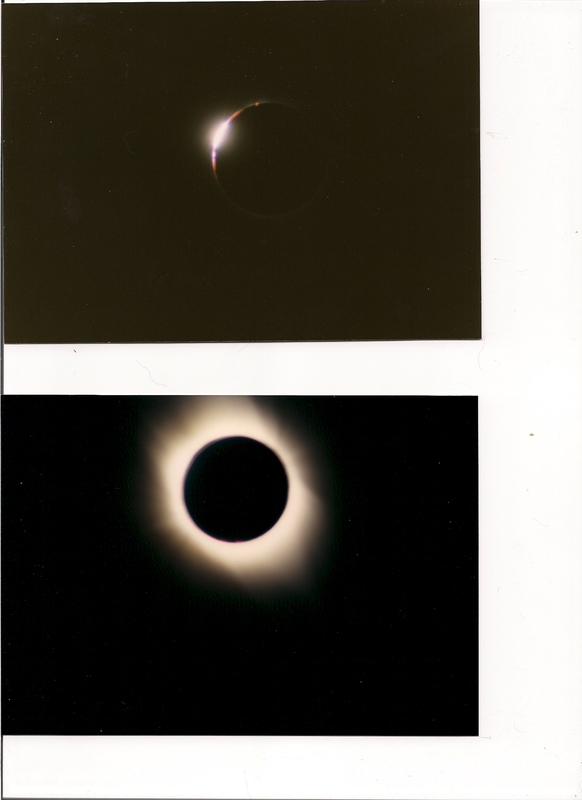 This entry was posted on October 3, 2009 at 14:05 and is filed under ECLIPSE CHASING, WHY I CHASE ECLIPSES. You can follow any responses to this entry through the RSS 2.0 feed. You can leave a response, or trackback from your own site.